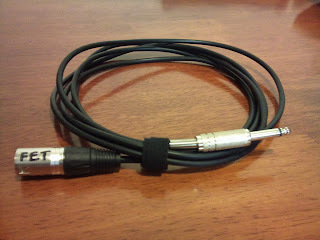 This cable houses a FET buffer. This is an impedance matching device that allows guitars and piezo pickups to be plugged directly into microphone preamps. The device is phantom powered (9-48V dc). This buffer sounds much better than the crappy transformers in cheap passive DI boxes, and it also obtains the full frequency range possible from piezo pickups (without a buffer, piezos have no low end. this is due to impedance mis-match). The buffer was designed by J. Donald Tillman, and the plans can be found here.